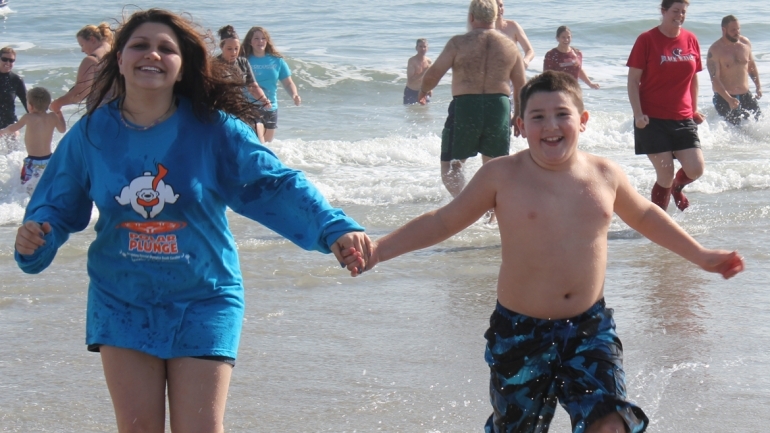 Each year Polar Plunge SC, an initiative of Polar Plunge Myrtle Beach supported by many caring individuals, businesses, groups, and teams in the community – enjoys fundraising and participating in area events that benefit the Special Olympics Programs in South Carolina. Come join us in making a splash for a great cause! Visit Classy to start fundraising. Register as an individual or form a team! To participate in the event, you just need to raise a minimum of $50 and complete a Waiver Form. This level earns a free Polar Plunge t-shirt. *Waiver forms will also be available at the event. Ask your friends, family, neighbors, and co-workers if they’d like to contribute to your fundraising goal or donate to support your team. Bring your friends and family to enjoy the event with you. Have fun! There will be music, games, food, merchandise, and a lot of smiles! Each “Plunger” earns incentives based on the total amount of contributions they have successfully raised: $50, $250, $500, and up. If you raise $250 or more, let us know right away so that we can have prizes ready for you on the day of the event! Raise $1250 and earn a Special Hotel Plunge Weekend Package. Includes a Friday and Saturday night stay, Dinner on Friday, Breakfast and Lunch on Saturday, plus other incentive gifts! If you need a printable form, click below. Please contact us at least 3 weeks in advance of the event. Copyright ©2017 Polar Plunge SC. All rights reserved. Web Design by GINGALLEY.